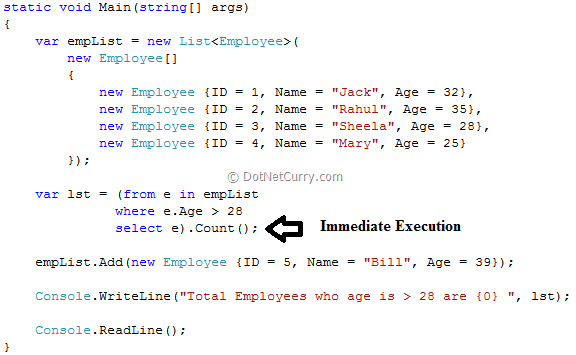 In LINQ, queries have two different behaviors of execution: immediate and deferred. In this article, we will take a quick overview of how Deferred query execution and Immediate Query Execution works in LINQ, and the difference between the two. 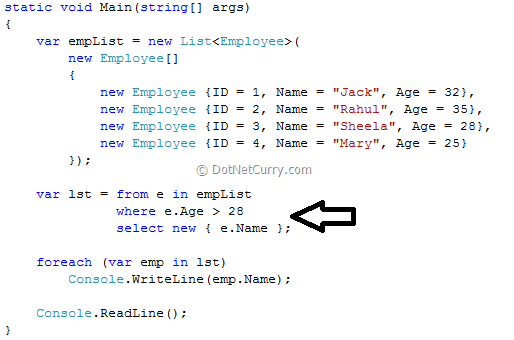 Looking at the query shown above, it appears that the query is executed at the point where the arrow is pointing towards. 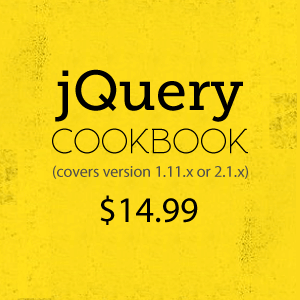 The query is actually executed when the query variable is iterated over, not when the query variable is created. This is called deferred execution. Now how do we prove that the query was not executed when the query variable was created? Notice we are creating a new Employee instance after the query variable is created. Now had the query been executed when the query variable is created, the results would be the same as the one we got earlier, i.e. only two employees would meet the criteria of Age > 28. What just happened is that the execution of the query was deferred until the query variable was iterated over in a foreach loop. Deferred execution is important as it gives you the flexibility of constructing a query in several steps by separating query construction from query execution. This allows you to execute a query as frequently as you want to, like fetching the latest information from a database that is being updated frequently by other applications. You will always get the latest information from the database in this case. You can also force a query to execute immediately, which is useful for caching query results. Let us say we want to display a count of the number of employees that match a criteria. In the query shown above, in order to count the elements that match the condition, the query must be executed, and this is done automatically when Count( ) is called. So adding a new employee instance after the query variable declaration does not have any effect here, as the query is already executed. The output will be 2, instead of 3. The basic difference between a Deferred execution vs Immediate execution is that Deferred execution of queries produce a sequence of values, whereas Immediate execution of queries return a singleton value and is executed immediately. Examples are using Count(), Average(), Max() etc. Note: To force immediate execution of a query that does not produce a singleton value, you can call the ToList(), ToDictionary() or the ToArray() method on a query or query variable. These are called conversion operators which allow you to make a copy/snapshot of the result and access is as many times you want, without the need to re-execute the query. Hopefully novice developers will now know the basic difference between Deferred and Immediate Execution of queries, and when to use what. I hope you liked the article and I thank you for viewing it! Mahesh: Glad you liked the article! This is very nice example..!!!! Nice article. Very good explanation. I like your explanation. Its very simple and clear. Thank you so much for your nice explanation. Nice article. Really good explanation. Very nice article, thanks a lot. A very nicely explained. Thanks Buddy. Well explained with simple example. Superb! 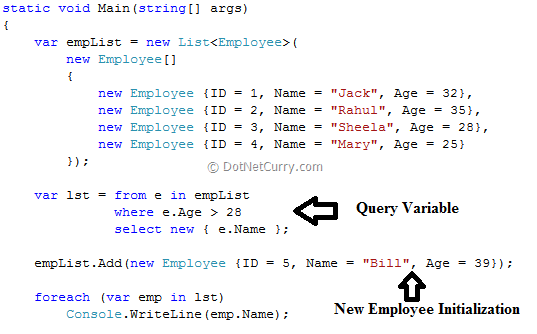 the way u explain in this article was brillant it is very easy to understand even the beginners in linq. keep posting this is the way of making the article complete. Nice one! Better add an example showing .ToList() as well as readers can correlate with the example given for deffered execution. Thanks for the nice and clear explanation of Linq execution approaches.